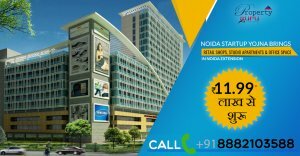 Noida Startup Yojna is an amazing real estate scheme that includes spectacular commercial property, Auriel Towne. Auriel Towne is a luxurious real estate property at Noida Extension under this scheme that offers spacious office space, retail shops and residential apartments. It has thoughtful design and is equipped with all the unique amenities. This office space provides much needed convenience that gives you the chance to attain work-life balance. It includes pleasing contemporary architecture and ample space for parking. The office and retail space are designed to cater 24*7 businesses.